By the time they came around with their overpriced offerings on my Munich-to-Copenhagen flight, it had been about five hours since I’d had breakfast, what with the train ride to the airport, and check-in, and the plane arriving late from its previous flight, and what-not. So, especially considering breakfast had just been a smoothie, I was a bit peckish, and willing to spend €5 for a sandwich. As it turns out, it was a worthwhile investment — I was surprised to find the sandwich quite flavorful. 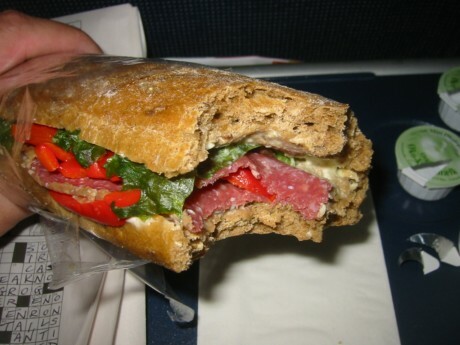 The salami had a nice bite to it, which was complemented very nicely by the subtle tang of the red pepper. I will have to bear that combination in mind for future replication.